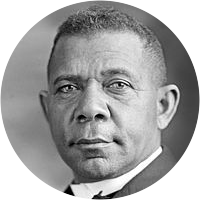 A collection of the best Booker T. Washington quotations. The world cares very little about what a man knows; it is what a man is able to do that counts. No race can prosper till it learns there is as much dignity in tilling the field as in writing the poem. I have observed that those who have accomplished the greatest results are those...who never grow excited or lose self-control, but are always calm, self-possessed, patient, and polite.